SAP Solution Manager 7.2. 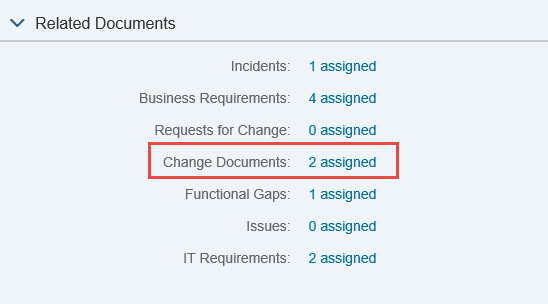 SP05 introduced a new “Related Documents” section in the Process Management application. This new section displays the type and number of “loosely coupled” documents assigned to the current element. These documents could be Incidents, or Requests for Change, or similar. SAP delivers several pre-configured document types, some active and some inactive. 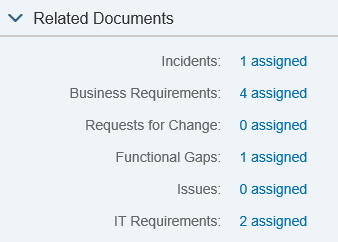 By default Incidents and Requests for Change are active. You can activate the other document types, such as Issues or Functional Gaps, by activating BAdI (Business Add-In) implementations – there is an activity in SAP Solution Manager Setup for doing this. We also realize that you might want to add additional documents types to the Related Documents section. We have had several requests to display Change Documents here as well. To do so only takes a few steps, which I will describe below. Make a small adjustment to the code in the class constructor. Copy the corresponding BAdI implementation. I’ve described each step in detail in the following sections, using the example of Change Documents. To make things easy, we will copy the BAdI implementation for Requests for Changes and adapt it for Change Documents. Call transaction SE24 (Class Builder). Enter “CL_AGS_CRM_API_SMUD_LCO_RFC” as the object type. 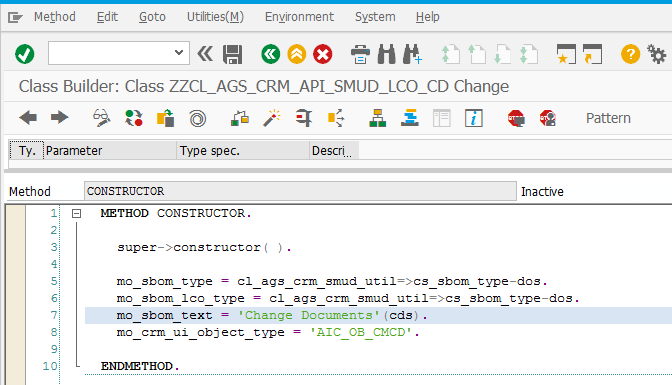 Enter ZZCL_AGS_CRM_API_SMUD_LCO_CD or another suitable name for the copied class. Enter package information (or select local if you do not want to transport the new class). While still in SE24, select Change for the copied class. Double-click method CONSTRUCTOR in order to edit the code. Change both instances of ‘cl_ags_crm_smud_util=>cs_sbom_type-cr‘ to ‘cl_ags_crm_smud_util=>cs_sbom_type-dos‘. SBOM type: the technical ID of the document type which the system stores in database table SMUD_SBOM_H. Take a look at the table in your system for examples. Change Documents use the ID “DOS”, as I provided in the example, as well as “CD”. Loosely coupled type: generally the same as the SBOM type, however there are some special cases where these types differ. For example, Functional Gaps (which are really a type of Incident) have SBOM ID = “INC” but loosely coupled type “ICCGAP”. The system uses the loosely coupled type to separate Functional Gaps from Incidents, although both are saved in table SMUD_SBOM_H with type “INC”. You can freely define the loosely coupled type, as long as it does not conflict with a type defined for another active BAdI implementation. SBOM text: this is the text which the system displays in the Related Documents section for the document type. CRM UI object type: if the document is a CRM process type, the system uses this attribute to construct the URL for navigation to the document. You can find the CRM UI object type by navigating to a document in the CRM UI, selecting a field, and pressing the F2 key. While still in the constructor method, select the Activate icon. Select all objects in the following dialog box. Call transaction SE19 (BAdI Builder). 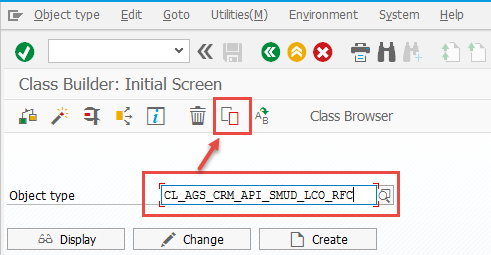 Enter AGS_CRM_API_LCO_RFC in the field “New BAdI Enhancement Implementation”. Enter a new name for the copied BAdI implementation, for example ‘ZZ_AGS_CRM_API_LCO_CD’. Note: after you copy the BAdI implementation, the system does not automatically enter the name of the copied BAdI implementation. Do not forget this! Enter the name of the newly copied BAdI implementation in the Enhancement Implementation field. BAdI Implementation: ZZ_AGS_CRM_API_LCO_CD (or your own suitable name). Implementing class: the name of the class you copied above, for example ZZCL_AGS_CRM_API_SMUD_LCO_CD. Select continue to create the new implementation. 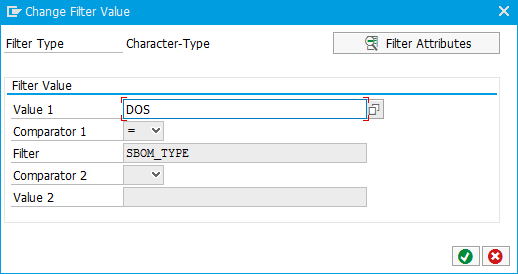 Enter ‘DOS’ as Value 1. Add a new OR combination. Select the Activate icon. You should be finished now.